– Jemima Sumgong speaking about the obstacles she faced (a hard fall and a near collision with a spectator) on her way to winning the 2016 London Marathon. Based on today, what chance does Rupp have in the Rio Marathon? 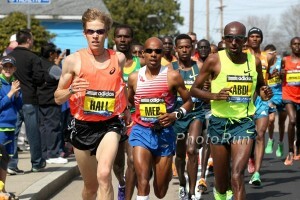 Ed Whitlock half marathon world record!! Glass City Marathon--- Hebron, Kentucky Cheaters! WTF: Can someone please tell me what the heck is going on here with the track at Baylor University (pic)? WTF: Did anyone else see the ad in the WSJ today featuring Flo-Jo? What the hell does it mean? 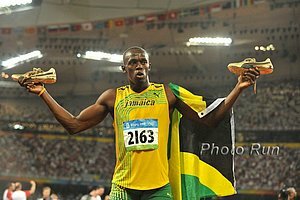 LRC The Greatest Ever? 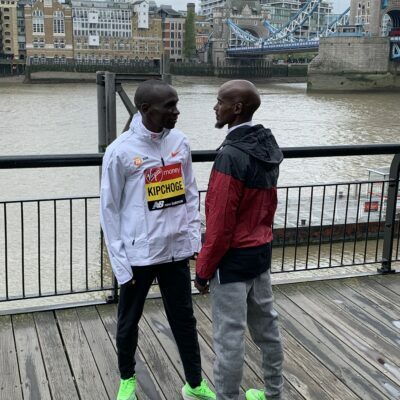 Eliud Kipchoge (2:03:05) Crushes Course Record, Runs #3 Time Ever At 2016 London Marathon NYC champ Stanley Biwott ran 2:03:51 but had to settle for second behind Kipchoge, who produced one of the greatest marathon performances in history. 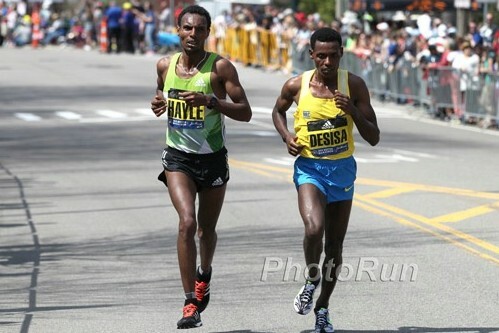 Kenenisa Bekele, racing his first marathon in 15 months, was third in 2:06:36. 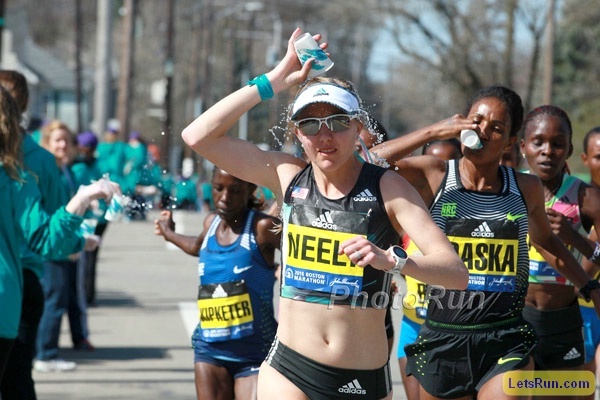 LRC: Was This The Greatest Marathon Performance Ever? 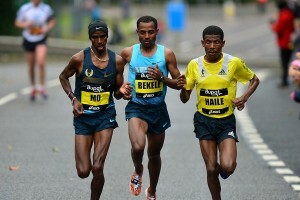 LRC: Kenenisa Bekele Is Back … But Will He Go To Rio? 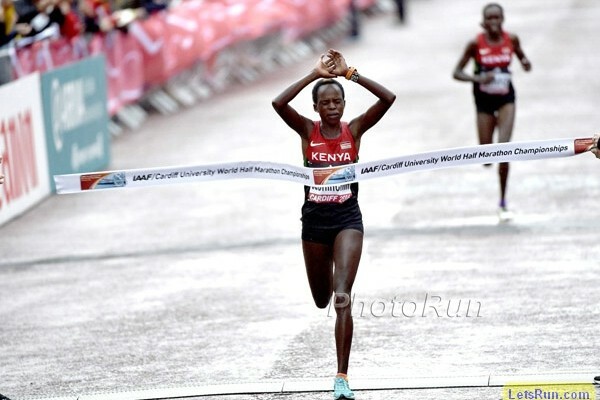 LRC What Drama: Jemima Sumgong Gets Taken Out From Behind, Gets Up And Wins London 2016 Sumgong for her first major win despite a big fall. Athletics Weekly British Trials Recap: Callum Hawkins, Tsegai Tewelde, Alyson Dixon, Sonia Samuels Win Battle For Olympic Selection Hawkins’ brother Derek was 3rd, but will have to hope for selection by committee. Daily Mail Reporting That Locals Stole Crates Of Water Bottles (Includes Video) The video is reminiscent of Black Friday in the US, except with water bottles. Game Of Thrones Actress Natalie Dormer And Top Gear Host Chris Evans Among The Celebrities Who Ran London Dormer was the top reported celebrity finisher in 3:51. UK Writer Defends The British Bias Of The BBC’s Broadcast Some favoritism is to be expected; whether the BBC takes it too far is a matter of opinion. 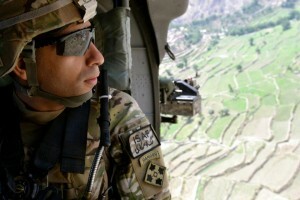 Sad News: 31-Year-Old War Veteran Dies After Collapsing Near The Finish Line Capt. David Seath died while running to raise money for a UK military charity. Ireland Olympic Marathon Selections Still Up In The Air After London The top Irishman was Sean Hehir, but his 2:17:20 won’t be enough to get him on the Olympic team. 31 Guinness World Records Were Set In London All are very random, but the fastest was the 2:39:09 ran by a guy dressed as Elsa from the movie Frozen. 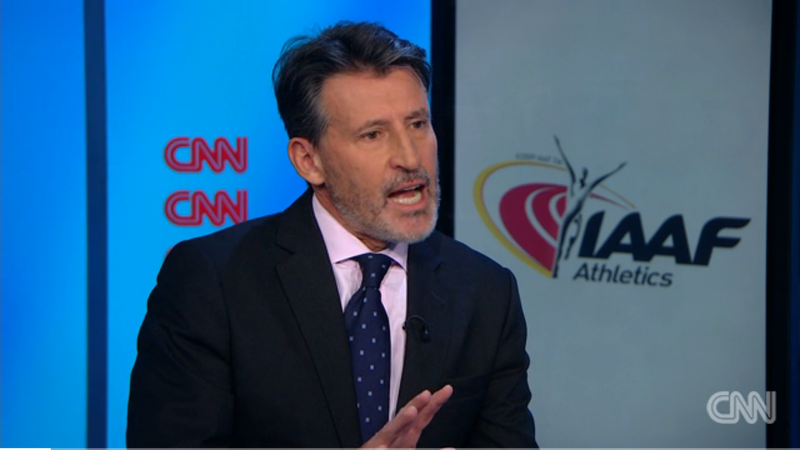 Catching Up With Seb Coe, Who Says The Anti-Doping System Now Is “On A Different Planet” Compared To When He Was An Athlete Coe touches on a lot of things including how the scandal has affected his family, June 17th being the “come to Jesus moment” for Russia, and how he’s finally communicated with Russian whistleblowers Vitaliy and Yuliya Stepanov. Russian Sports Minister Says Athletes Have A “Moral Right” To Be In Rio We’re not sure if anyone in Russian sports should be pulling the ethics card right now. New Zealand Names 10 People To Olympic Team – List Includes Nick Willis, Zane Robertson, Angie Petty And Nikki Hamblin 13:15/27:45 man Jake Robertson doesn’t have the standard. Former Pole Vault World Champion Giuseppe Gibilisco Is One Of Five Italian Athletes Cleared Of Evading Doping Tests By The Country’s Anti-Doping Tribunal On Friday 18 of the 26 initially banned have now been cleared. LRC LaShawn Merritt And Kirani James On Track To Collide In Rio, Is Yohan Blake Back? Donovan Brazier Stumbles, A Marathon Legend Retires And Women’s Sport May Be Changing For The Worse Get up to speed as we span the track and field globe. 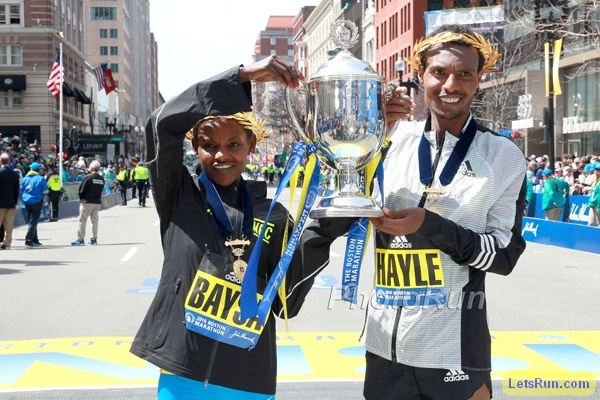 May 29: Good Read: Former 1,500 Runner Elkana Yego Could Surprise The Favorites At The Ottawa Marathon The 22-year-old caught the attention of former Boston champ Wesley Korir when he won a local 3K running barefoot. We Hope Your PR Didn’t Come From Manchester: Times From The Last Three Years Of The Greater Manchester Marathon Have Been Invalidated As The Course Was 380m Short For someone running 3-hour pace, that’d be 1 minute and 37 seconds added to their time. Kenenisa Bekele Admits He’s Not 100% Fit For London But rather than talk retirement, he says he still wants to eventually break the WR. 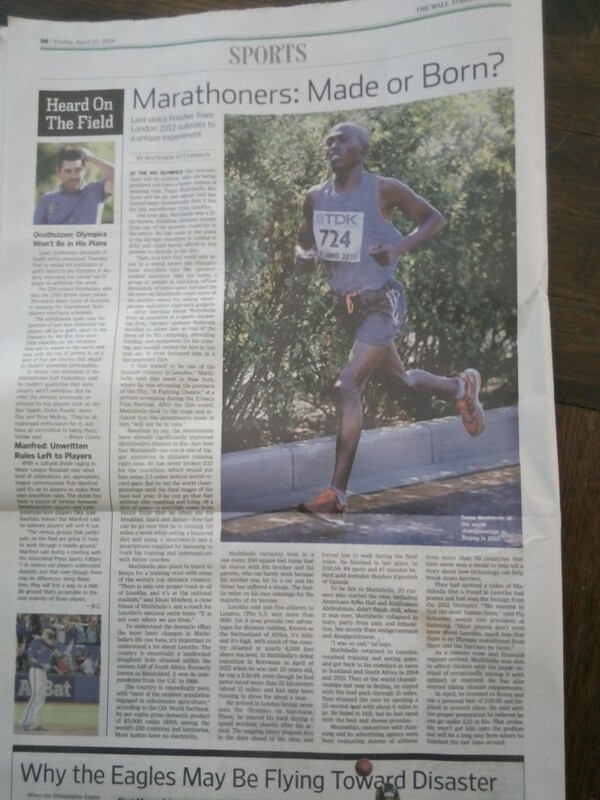 Good Read: Despite Money And Fame, Eliud Kipchoge Chooses To Live A Simple Spartan Lifestyle In A Training Camp Where He Has To Do His Share Of The Chores At his camp Kipchoge shares a tiny room, has to chop vegetables, trim the garden and even clean the toilets. Eritrea’s Ghirmay Ghebreslassie: From Pacemaker To World Champ The first time Ghebreslassie met the elites in London was when he paced the Chicago 2014. Now he’s back as their equal. Former 800/1,500 Olympic Champ Kelly Holmes Has Struggled With Injury Issues During Marathon Training However, she says no matter what she’ll finish on Sunday and “be sprinting like Usain Bolt” at the finish. World Champ Peres Jepchirchir Crushes CR At Yangzhou Jianzhen Half To Win In 67:21 Over A Deep Field On the men’s side, Mosinet Geremew won defended his title in 60:43 after winning a five-man battle in the last 300m which saw the top 5 finish within 4 seconds of each other. Japhet Kosgei (2:10:46) And Zsofia Erdelyi (2:35:37) Take Duesseldorf Marathon Titles Germany’s Hendrik Pfeiffer booked a ticket to Rio with a 2:13:11 debut. 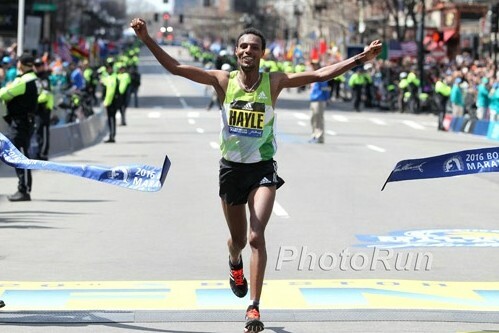 Turkey’s Ali Kaya (60:16) Defeats World Record Holders Leonard Komon And Zersenay Tadese To Win Vodafone Istanbul Half Marathon; Violah Chepchumba (68:17) Wins Women’s Race Tadese was 2nd and Komon 4th in the men’s race. Penn State’s Brannon Kidder Gets Big 1,500 Win At Stanford Twilight Kidder ran 3:40.11 to beat Joshua Thompson, Sean McGorty, David Elliott and Grant Fisher. *Full Results Georgetown’s Joseph White ran 1:46.67 to beat Isaiah Harris with Cristian Soratos was 4th (1:49.66). Maggie Vessey (2:02.18) and Fresno State’s Annemarie Schwanz (4:14.89) won the 800/1,500. Baylor Wins Eight Titles At Michael Johnson Invitational *Full Results Laura Roesler took the 800 in 2:00.72. HS Star Drew Hunter Beaten At Princeton In Outdoor Opener By Former 4:01 HSer Garrett O’Toole And Sam Penzenstadler Hunter ran 3:42.42. History: Courtney Okolo Becomes 1st Collegian To Break 50 In 400 – 49.73!! Hand Her The Gold Now? Dafne Schippers Opens Season With 22.25 In Gainseville Last year, she opened out at 22.63. 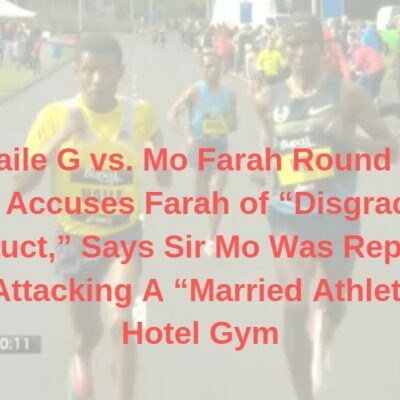 Did Mary Keitany fake her fall? 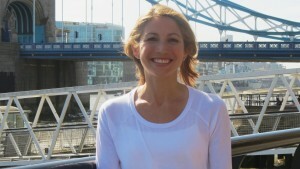 Tell us what you think: Should Aselefech Mergia be DQd from 2016 London Marathon? Great day for Kenya, Kipsang is most probably done. We thank him for the great ride! 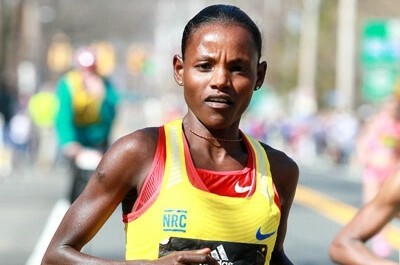 Video: Jemima Sumgong Wins London Despite Fall The video of the fall is shown after the finish. 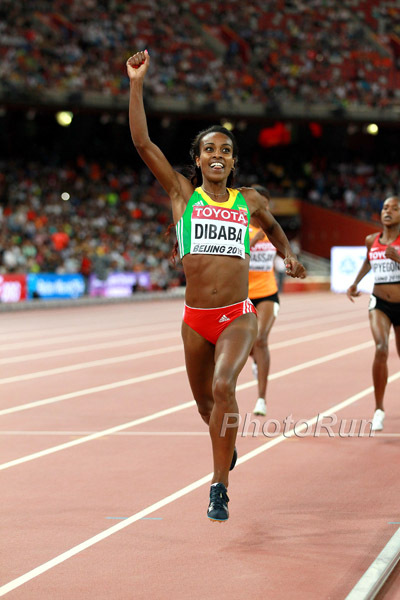 Previous: Genzebe Dibaba Contemplating 5K/10K Double In Rio Dibaba says she is set on doing the 5K and the schedule for a 5K/10K double is better than the 5K/1,500 (1,500 final and 5K heat on same day). GB’s Jonny Hay Using “Old School” Training To Prepare For His Marathon Debut Hay will be among those fighting for a spot on the UK team for Rio. 42-Year-Old Legally Blind Runner Hoping London Leads To A Spot On US Paralympic Team Donald Balcom runs 90 miles a week on the treadmill while working as a mechanical engineer for the Navy. He’s coached by GB Olympian Andrew Lemoncello. Sensationalist UK Headlines? 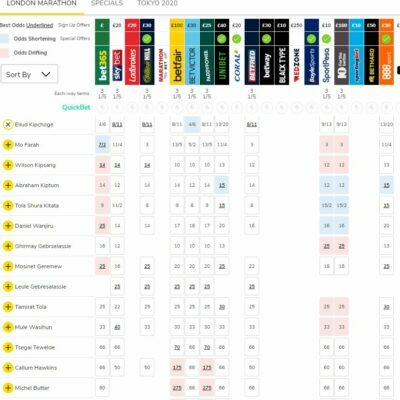 London Marathon Could Face Snow For First Time In 35-Year History Of The Race The article talks about the “icy” gusts and snow, but weather.com is predicting a high of 52, low of 40 and only 10% chance of precipitation. *MB: Forget fast times in London, bad weather, it may even snow! IAAF Will Make Final Decision On Russia’s Olympic Fate On June 17th The IAAF will hear reports from its task force and make a decision. 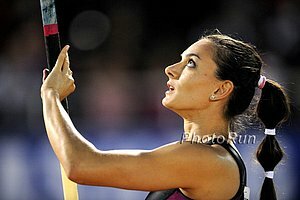 Six More Russian Track Athletes Banned For Doping They include mid-d runner Olesya Syreva, who gets an 8-year ban for her 2nd doping offense. New Forensic Evidence Claims Oscar Pistorius Attacked Reeva Steenkamp With An Air Rifle And Cricket Bat Before Shooting Her That’s some pretty heavy evidence to come out after the trial (and 3 years after a murder). He’s now sponsored by Samsung. Mo Farah And Galen Rupp Will Race At Pre Classic; Which Events Is TBD Alberto Salazar says he’s torn because he doesn’t think Rupp should run a 10K so close to the OT, but he doesn’t know if he’d be competitive in the 5K. 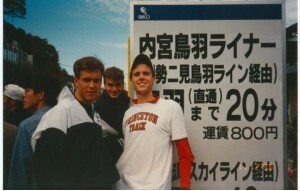 Sounding likely Rupp will run the marathon in Rio. 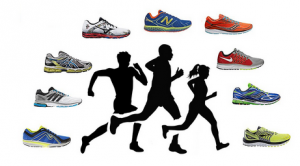 Interesting Read: Ken Goe And Others Ask If The Collegiate Season Is Too Long For Distance Runners Goe has quotes from multiple athletes and coaches and most agree that peaking three times a year is too much. That said, we agree with Alberto Salazar, who argued Edward Cheserek isn’t overworked as most of his races are very easy wins. And remind you that Andrew Wheating’s best season by far was when he was under the structure of the collegiate system. 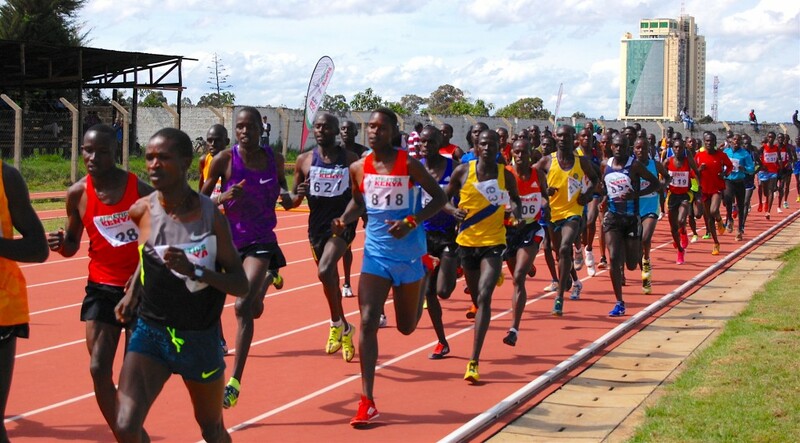 LRC's latest dispatch from Kenya includes a recap from the "City of Champions," where Andy Arnold tells you who's looking good (Ezekiel Kemboi, Elijah Manangoi, Timothy Cheruiyot), why Kiprop can go sub-3:26 this year and why he's become a Birech fan. Plus did he spot Kenyan's newest teen sensation? Updated with altitude conversions.